There’s something in the water, and brewers love it. Anchorage’s glacial water flows to taps all over the city, and local brewers know it makes the best starting ingredient for brews from pilsners to porters and everything in between. Anchorage’s brew scene traces back to the mid ‘90s, and the last few years have seen more growth. With a dozen breweries in Anchorage proper and more than 30 statewide pouring in Anchorage, Anchorage is the place to be for Alaska beer. 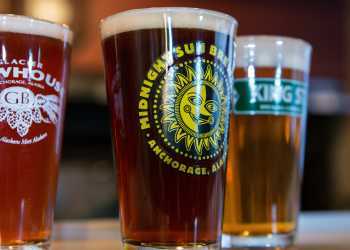 Midnight Sun Brewing Company has been brewing beer since 1995. The flagship Sockeye Red IPA leads a list of more than a dozen seasonal, experimental and specialty brews in LOFT, the restaurant and tasting room of their south Anchorage location. A great menu of local food stands alongside their winning roster of brews. There is a free brewery tour every Thursday at 6 p.m.
Glacier BrewHouse brews old-world style, featuring cask-conditioned ales and oak-aged beers, rotating seasonal brews and a barleywine called Big Woody, which has taken home top honors at prestigious festivals. Look up in the restaurant, and the ceiling might remind you of a barrel. Look down and you might imagine the vast, below-ground store room of concoctions that will one day end up in your glass. Moose&apos;s Tooth Pub & Pizzeria is definitely worth the visit. The microbrewery came first, but they are also renowned for their handcrafted pizzas and First Tap Thursday events, which celebrate the release of the latest draft with live music. The annual release of Darth Delirium, a Belgian stout with chocolate, is one of the most anticipated. The house brewery, Broken Tooth, also sells a limited number of cans and 22 oz. bottles to take home. 49th State Brewing brings beer recipes perfected in the shadow of Denali to their new Anchorage brewpub. With one of the larger lists of house-made beers, it’s almost a sure thing to find a style you like. On a clear day you can see Denali from their gorgeous deck, one of the biggest and best in the state. A whole crop of new breweries have opened have opened recently, turning an area of south Anchorage pioneered by Midnight Sun into a veritable "Beermuda Triangle." Turnagain Brewing opened their doors in 2018, with a focus on sours and other Belgian style brews. Cynosure Brewing set up operations just off of Dowling Road in midtown, offering a roster including rhubarb gose, German schwartzbier, a wit and a saison. Sip something with a bit of sweetness at Double Shovel Cider Co., Alaska&apos;s first micro-cidery. Sometimes crisp, sometimes surprising and always tasty, each concoction uses hand-picked Alaska apples, berries or syrups. Not sure how to sip at multiple spots? Check out the brew tours offered by Big Swig Tours. Anchorage restaurants often boast and impressive number of local brews. Humpys has 52 taps, none from the big domestic guys. You can even take the taste of Alaska home. Talkeetna-based Denali Brewing Company crafts cans of pilsner, stout and red (among many others) as one of the largest breweries in Alaska. Silver Gulch Brewing has an outpost at the airport. Since the shop is inside security, you can fill a growler with Alaska beer or take home select 22-ounce bottles from breweries across the state. January is the time to visit for true hop heads and ale aficionados. The Great Alaska Beer & Barley Wine Festival, held in Anchorage each January. With award-winning ales, barleywines and seasonal brews, there&apos;s sure to be a perfect pint for every connoisseur. Find some spirit - literally - Anchorage has two distilleries. Anchorage Distillery bottles plain, raspberry blueberry, and ghost pepper vodkas, as well as gin and moonshine-style whiskey. Alaska grown wheat, barley and rye form the foundation of recipe. Take a tour Thursdays at 6 p.m. and sip the end results in the adjoining tasting room. Alaskan Spirits Distillery focuses on vodkas, with blueberry and fireweed among the offerings mixed into craft cocktails.